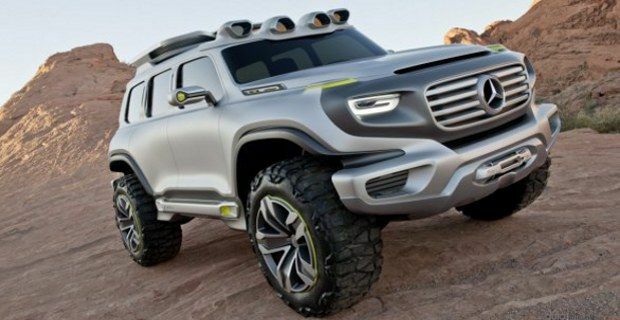 Mercedes has designed Ener-G-Force, a new concept off-road based on a futuristic reinterpretation of Mercedes G-Class. The design has been created by Mercedes to enter the 2012 Los Angeles Design Challenge, which theme for this year competition was “Highway Patrol Vehicle 2025”. The designers at Mercedes Advanced Design Studio in Carlsbad, California have also developed the study into a 1:1 scale model that will be unveiled during the event. The model is a sober version of the original design, created for civil usage, rather than police enforcement and reflects the stylistic language and main characteristics of the Mercedes G-Class. The design study has been regulated by strict criteria, which have taken into account both the needs of the police force and also the environmental requirements of the vehicle from the future. As Mercedes Director of Design Gorden Wagener said: "The Ener-G-Force is the vision of an off-roader that, while reflecting tomorrow's adventures, also invokes the genes of the Mercedes-Benz off-road icon, the G model. Modern and cool, it could also be a clue about a new beginning for the off-road design idiom of Mercedes-Benz." Mercedes Ener-G-Force is equipped with roof-mounted tanks, which gather recycled water. The water is then transferred to a “hydro-tech converter” that produces hydrogen, used to operate the fuel cells. The electric energy produced is then stored in the side skirts of the innovative vehicle. Another forward-thinking solution created by Mercedes. Mercedes Ener-G-Force is powered by four electric motors and has an operating range of 800 Km, emitting just water, thanks to the F-Cell Hydrogen system. The torque produced by the vehicle is cleverly delivered to each wheel and an innovative topographical scanner, able to analyse the environment, communicates with the central control system in order to adjusts its settings and adapt to different types of surface. The ultra-modern off-road has quite a menacing appearance, with an aggressive-looking front grille, 20-inch wheels fitted with very large off-road tyres and covered by beefed up cladding and a small windscreen, which seems designed to protect the vehicle in case of fire-fights. The numerous references to the Mercedes G-Class are clearly visible on the side line, at the rear and front, where G-shaped indicators, LED headlights and font air intake are situated. The look of Mercedes Ener-G-Force anticipates the style and lines of the next-generation Mercedes G-Class, which is also expect to features some of the striking technology. Unfortunately we will have to wait until 2015 to see the vehicle in production version, for now we hope you'll enjoy the photo gallery.